VMware ESXi 6.5 is a hypervisor (virtualization server) created by VMware that allows you to run virtual machines with their own operating systems. Unlike version 5 of ESXi where you had to manage your ESXi server with a Windows client. Version 6 is manageable from a simple web browser, and securing the server with a valid SSL certificate (from a trusted CA) has been greatly simplified. 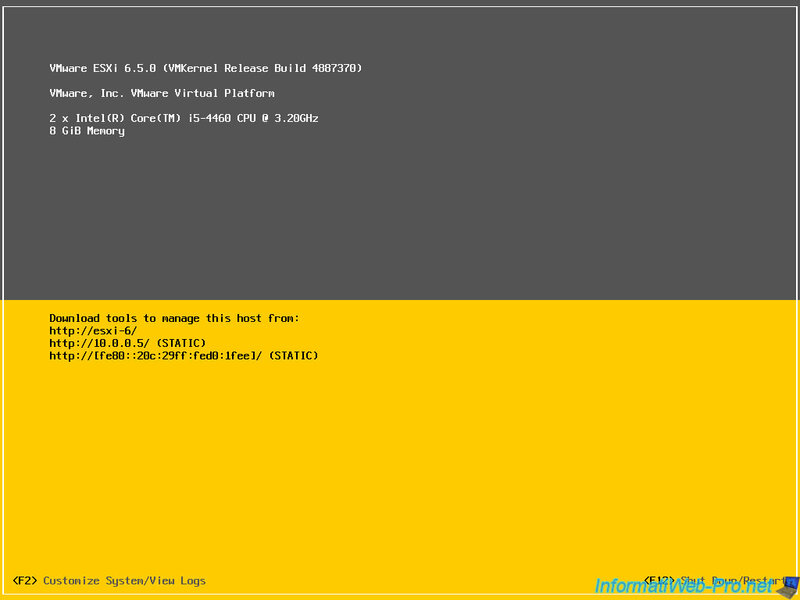 Note that VMware ESXi requires that processor virtualization be enabled in the BIOS. 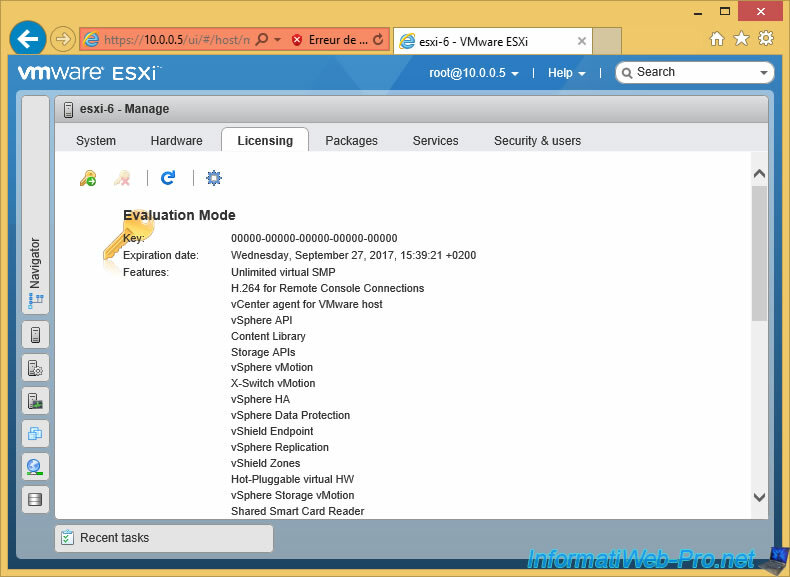 If you want to test VMware ESXi in a VMware Workstation virtual machine, be sure to select "VMware ESXi 6" as the operating system and verify that the "Virtualize Intel VT-x/EPT or AMD-V/RVI" box is checked in the "Processors" section of its settings. VMware ESXi 6.5 is free, but it requires a free serial number to upgrade from the 60-day trial to a full version. 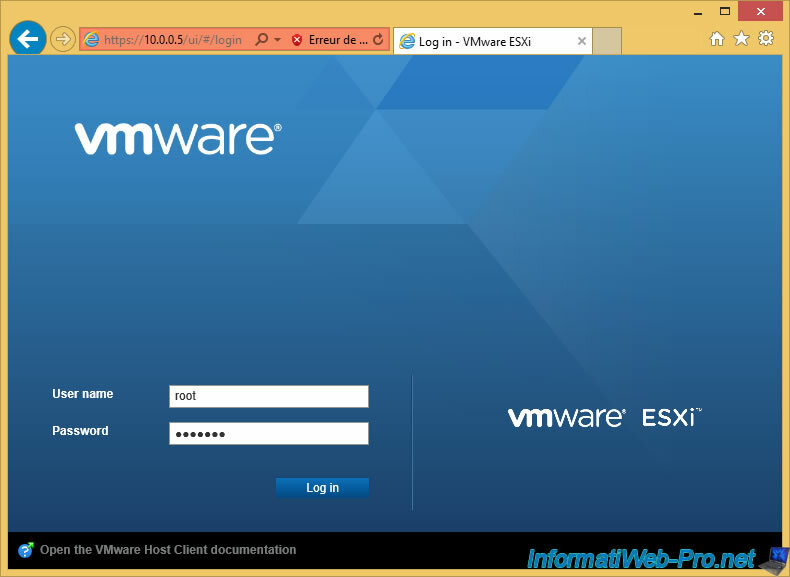 To download VMware ESXi, you will need to create a free account on vmware.com. When you try to download VMware ESXi, VMware will generate a new "VMware vSphere Hypervisor 6 License" serial number for you. 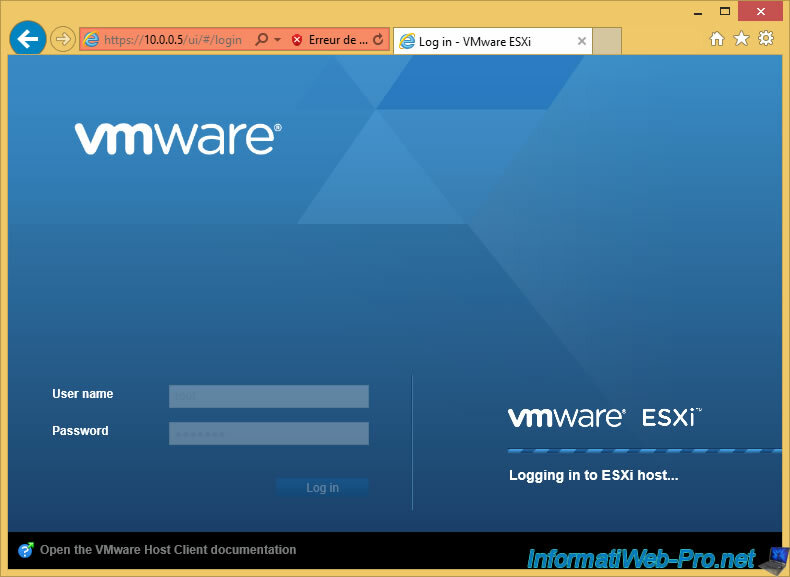 To begin, choose the "ESXi ISO image" download. Then, burn this iso file and start your computer on the burned CD. 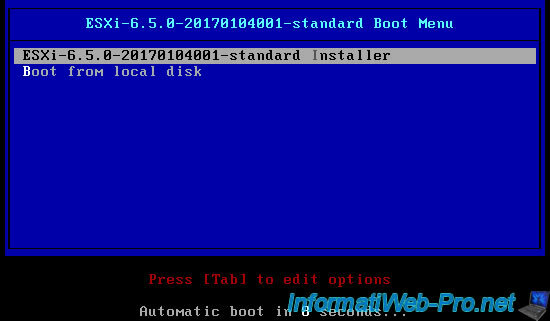 At startup you will see an "ESXi 6.5.0 standard Boot Menu" menu. 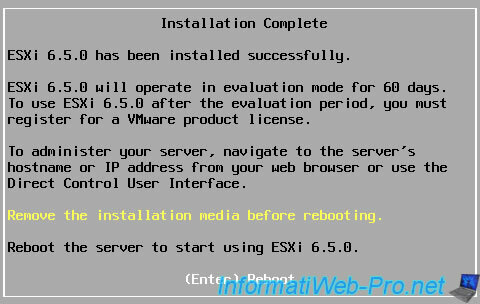 The installation of an ESXi 6.5.0 server is apparently identical to that of the ESXi 5 server. To learn about hardware that is compatible with VMware ESXi 6.5.0, see the VMware Compatibility Guide on the VMware site. Accept the license agreement by pressing F11. VMware ESXi will detect your hard drives. 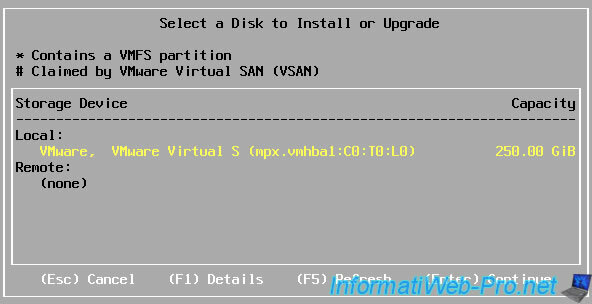 Select the hard disk on which you want to install VMware ESXi. 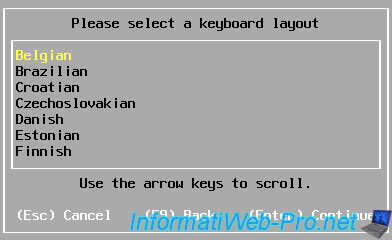 Select the language of your keyboard. Specify a password for the ESXi server's root account. 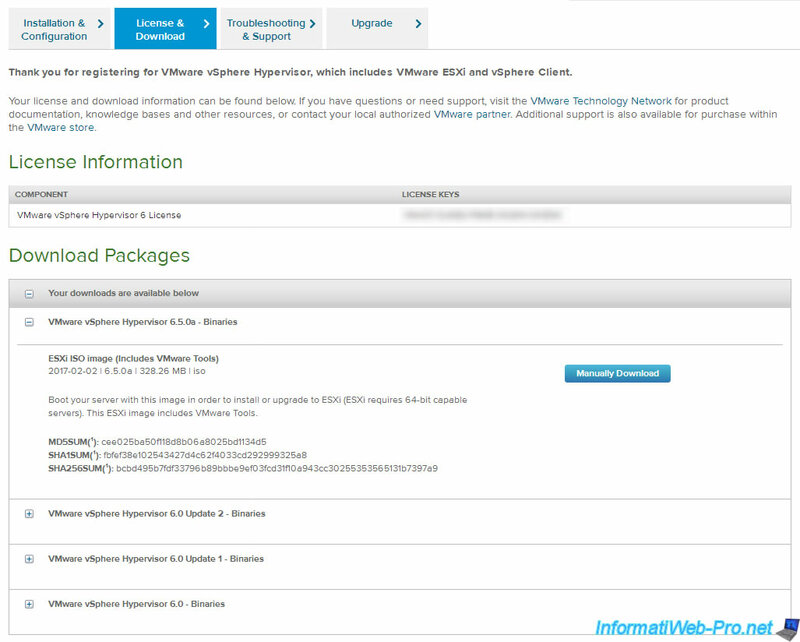 VMware ESXi will retrieve additional system information about your computer, including verifying that processor virtualization is enabled in your BIOS. 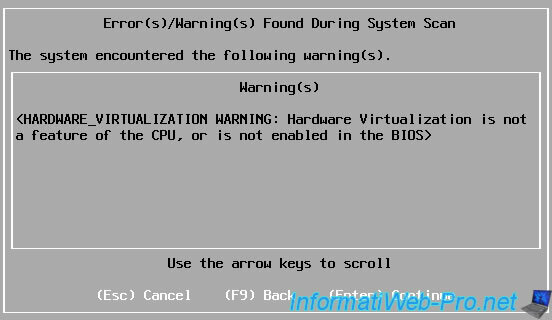 If the processor virtualization is NOT enabled, VMware ESXi will display this warning : Hardware Virtualization is not a feature of the CPU, or is not enabled in the BIOS. To confirm the installation of VMware ESXi on the desired hard disk, press F11. When the installation is complete, remove the CD from the CD/DVD drive and press Enter to restart the computer. Note : this may take a few seconds. On reboot, VMware ESXi will start up. By default, VMware ESXi automatically receives an IPv4 address from the DHCP server on your network. However, any server must always have a static IP address. To configure the network settings for the VMware ESXi server, press F2 (Customize System/View Logs). Log in with the root account. Press Enter to change these settings. If your server has more than one network adapter, you can select from which network adapter you want to manage your server. In our case, our ESXi server has a single network adapter. Then, go to IPv4 Configuration to set a static IP address for your ESXi server. By default, the ESXi server is configured to automatically obtain an IP address from a DHCP server. To set an IP address on your ESXi server, choose the "Set static IPv4 address and network configuration" option. the IP address of your gateway (router or box). Now, our ESXi server has a static IPv4 address. 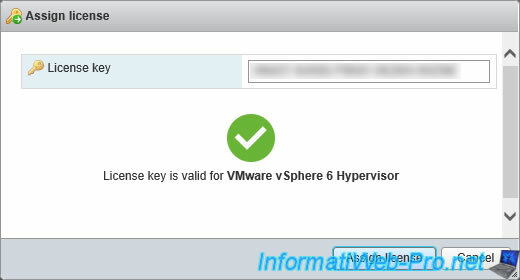 To be able to secure your ESXi server with a valid certificate, it's strongly recommended that you set an unique name on your network. The name of your server will have to be indicated as "common name" in the SSL certificate so that it's valid for your server. To change the name of your server, go to : DNS Configuration. the address of your Active Directory server or local DNS server, if you have one. the IP address of your gateway (router) as an alternate DNS server. an unique name for your ESXi server. Don't add the "my-domain.local" suffix here, even if you have a local domain. Then, exit the ESXi settings by pressing Escape repeatedly. 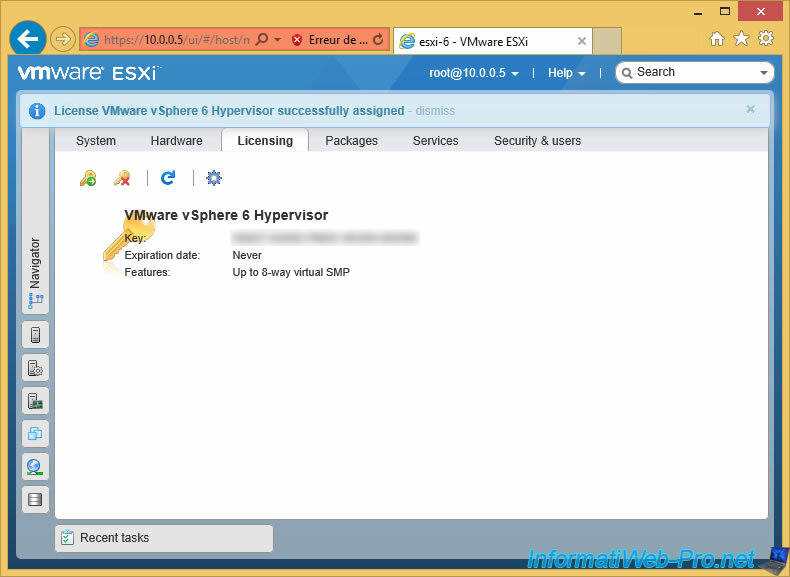 ESXi will prompt you to restart the network management service because you have changed the network settings of your ESXi server. Now, our server has an unique name and a static IPv4 address. On the VMware ESXi home screen, you will see that your ESXi server has a static IP address and a new name. Since version 6 of VMware ESXi, you can manage your server from a web client accessible from any modern web browser. At this time, your web browser will display a warning about the server's SSL certificate, which is self-signed by default and is therefore not reliable. 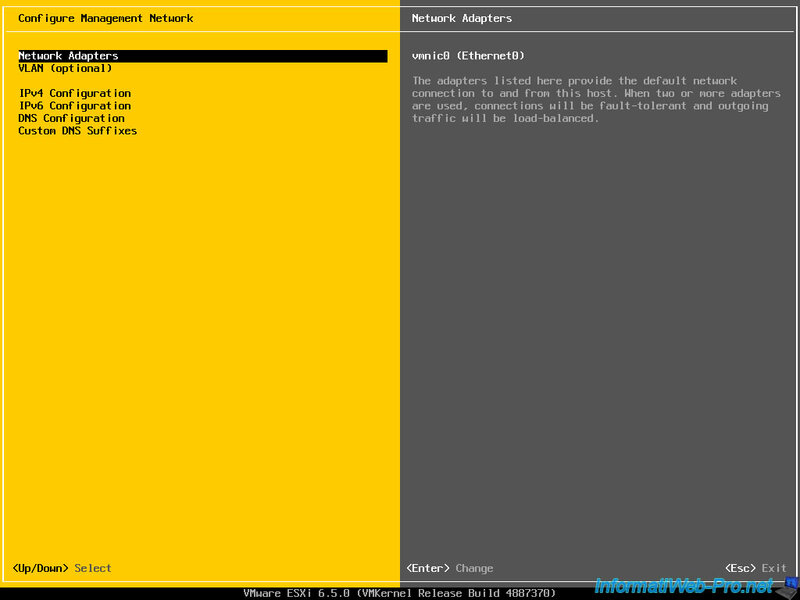 The web client connects to the ESXi server. 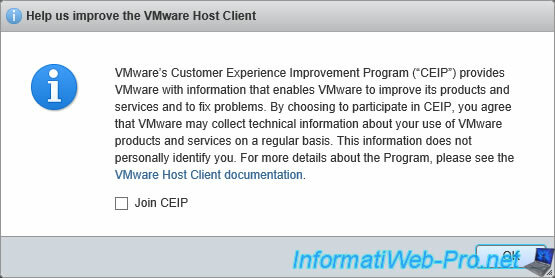 Accept or not to join the VMware's Customer Experience Impovement Program (CEIP). 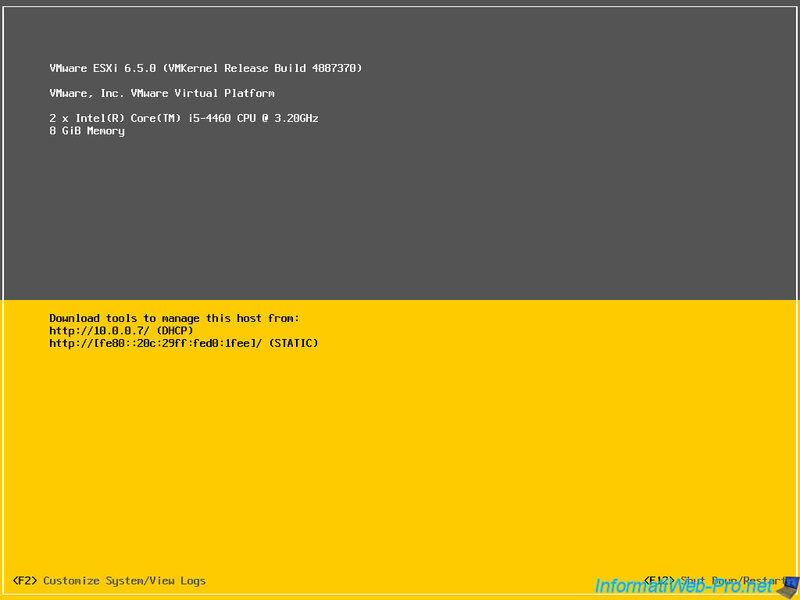 As you can see, by default, the VMware ESXi server is installed in a 60-day trial version. 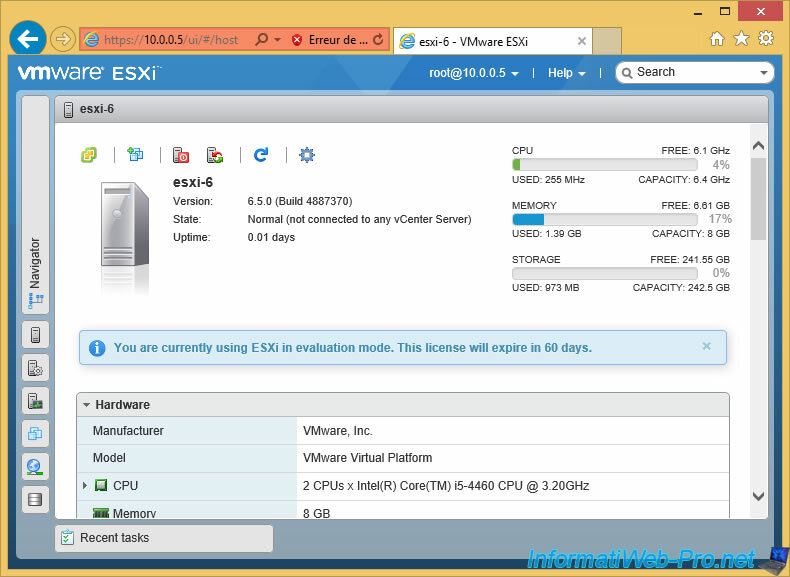 To register your ESXi server with your serial number obtained on vmware.com, go to the settings (via the menu on the left) and then in the "Licensing" section. 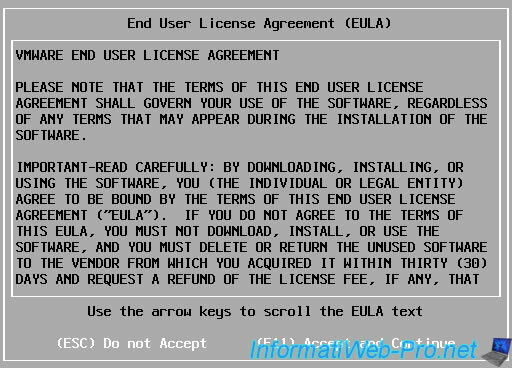 Enter your serial number, then click on "Check License", then "Assign License". Now, your ESXi server is registered and the license will never expire.